This book is one of the finest I have ever read. To write a foreword for* it is an honor, difficult to accept. Everyone knows that architects and master masons, long before there were mathematical theories, erected structures of astonishing originality, strength, and beauty. Many of these still stand. Were it not for our now acid atmosphere, we could expect them to stand for centuries more. We admire early architects' visible success in the distribution and balance of thrusts, and we presume that master masons had rules, perhaps held secret, that enabled them to turn architects' bold designs into reality. Everyone knows that rational theories of strength and elasticity, created centuries later, were influenced by the wondrous buildings that men of the sixteenth, seventeenth, and eighteenth centuries saw daily. Theorists know that when, at last, theories began to appear, architects distrusted them, partly because they often disregarded details of importance in actual construction, partly because nobody but a mathematician could understand the aim and func- tion of a mathematical theory designed to represent an aspect of nature. 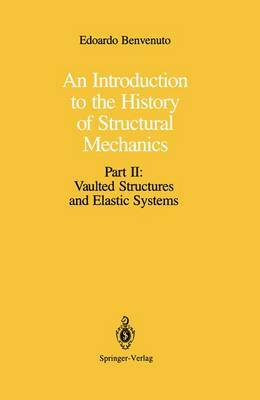 This book is the first to show how statics, strength of materials, and elasticity grew alongside existing architecture with its millenial traditions, its host of successes, its ever-renewing styles, and its numerous problems of maintenance and repair. In connection with studies toward repair of the dome of St. Peter's by Poleni in 1743, on p.